In Charity of Flood Victims. Online shop for stamps, postal history covers, postal stationery. Topical covers and stamps. Bangladesh new issue information. Online auction. Issued by post office and sold to collect fund for victim of Floods in Bangladesh. NO Official FDC or post mark issued. Exact issue date not known. Private cover found used with date 13th September 2007. Sheet had 6 stamps printed for issue but finally stamp at left top corner cancelled. By tear off manually cancelled stamps from the sheet let issued in the format of 5 stamp sheetlet. 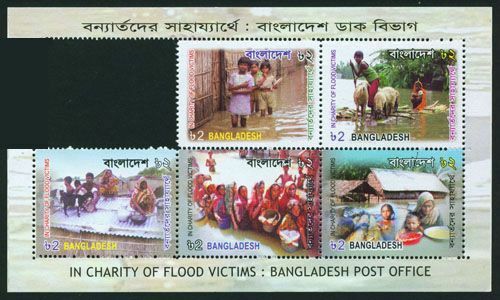 The stamps sold collect fund by Bangladesh post office to help Flood victims in Bangladesh.